It is interesting how sometimes you overlook the simple. 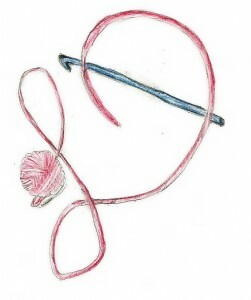 I always think of it as a challenge to see if there is a new way I can use a crochet hook; create a new approach to an old technique or combine pieces of several different techniques to create something different. 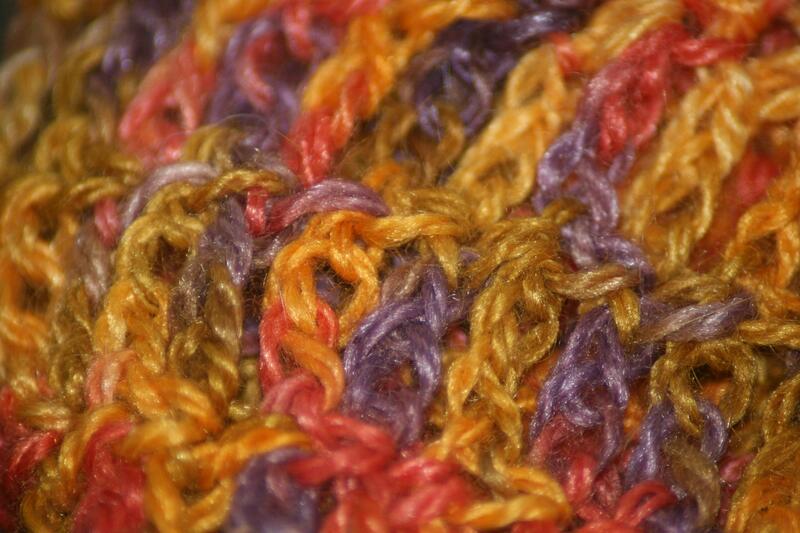 However, sometimes it is just a simple chain stitch that can make the difference. Everyone that has used a hook has created a chain. 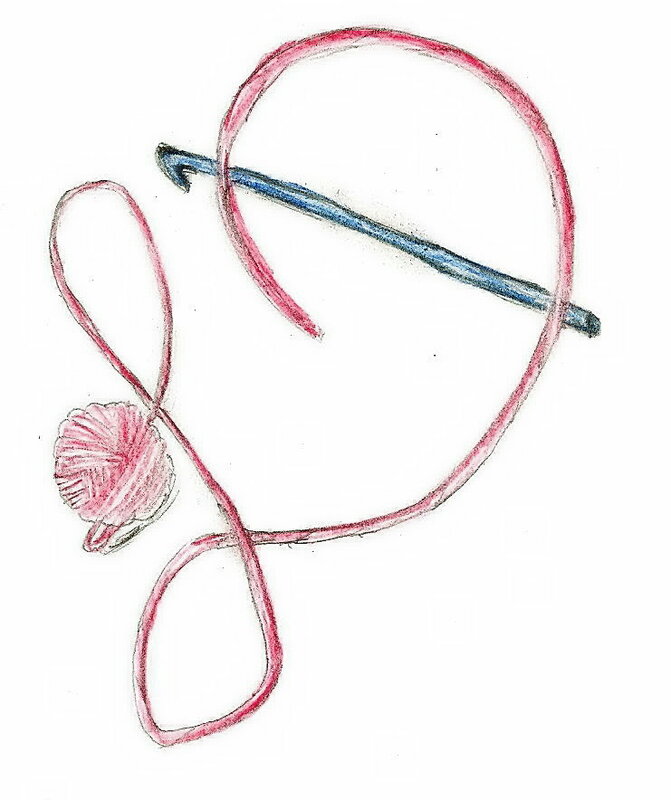 It is the foundation to the beginning of almost every piece of fabric that a crocheter creates, but can it create a fabric its self? Of course it can. In my latest design, I basically stumbled upon using the chain in this manner. I was using a lovely yarn, which had a very pretty, yet short color repeat. I wanted to get an effect of color pooling, or at least spans of the same color. Most crochet stitches were unable to aid me in creating this effect, as each stitch would use enough yarn to have more than one color in a stitch. Tunisian crochet allows for the color to work this way more, but I wanted a fabric that was a little more fluid. So I began to play. Sometimes when I am attending an event of one of my children, I bring along a yarn that has no particular project and play with various stitches as a visit with other parents or cheer my child on. This was the case with this design. My fingers almost mindlessly began creating chains stacked upon chains, and I was really drawn to the result, from it Crossroad Leaves Shawl was born. This shawl is worked from the center outward with a simple stitch repeat for the main fabric, and has two bands of my rendition of leaves, and edged with smaller “leaves”. Overall it has a beautiful drape, and feels great in the hand. It is actually a one skein project, using Lisa Souza Dyeworks Baby Alpaca Silk Petite, the color way is a limited edition (Rhinebeck 2015), but the color way of Deep Fall, Fall Leaves, or Leaf Pile easily can fit the bill for an almost exact replica. However there are so many beautiful colors available and this pattern would easily highlight any colors that may have a short repeat. The creation of this design does have me reviewing some stitches I may have overlooked (this particular stitch is already destined for another design), and opening my thoughts to some of the simple structure that is the back bone of crochet. 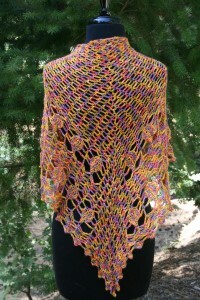 If you would like to add this pattern to your collection, you can find it on Ravelry & Craftsy. This entry was posted in Patterns/Design Thoughts, website and tagged baby alpaca, baby alpaca silk petite, basic, chain, color way, Crochet, crossroad, dean, drape, Dyeworks, hand, leaf, leaves, linda, Linda Dean, lisa, Lisa Souza, petite, repeat, shawl, short, silk, simple, souza, stitch by webmaster. Bookmark the permalink.